On a visit to Standard Motor Products' fuel-injector assembly line in South Carolina, Atlantic writer Adam Davidson asked why a worker there, Maddie, was welding caps onto the injectors herself. Why not use a machine? That's how a lot of the factory's other tasks were performed. Maddie's supervisor, Tony, had a bracing, direct answer: "Maddie is cheaper than a machine." Davidson's complex, poignant story, Making It in America, revealed some chilling data about where American manufacturing is headed. It's a matter of simple math. Maddie makes less in two years than a $100,000 machine would cost, so her job is safe—for now. What are the odds your job—your career—will be the next one that can be done better by a machine? Alarmingly high. If you're an average sports fan, you may have heard about Narrative Science. But if you're someone who writes about sports for a living, you've definitely heard of it—you probably already know it's coming after your career. Part of a joint research project between Northwestern University's schools of engineering and journalism, Narrative Science was officially founded in 2010. It's now led by a small hodgepodge of computer scientists, journalists, and businesspeople whose goal is to use data to create stories via the company's artificial intelligence platform, Quill. Quill takes data fed into it—a football game's stats, for instance—and in seconds pumps out stories. They won't win any Pulitzers, but they're occasionally better than what humans produce. The sports site Deadspin, last year, challenged Narrative Science to write a better baseball article than one they'd found in a local paper. In the story, the reporter buried the lead—that the pitcher had thrown a perfect game—near the bottom of the story. Narrative Science entered the box scores into Quill and, lo and behold, it came up with an article that announced the perfect game right up top. Pablo S. Torre is a former staff writer for Sports Illustrated and a current senior writer at ESPN magazine and ESPN.com. He says that while longform feature and profile writers are probably years away from having to worry about a computer taking their jobs, thanks to the nuance required of them, wire service sports writers are not as lucky. "My sense is that an increasing number of casual readers are skipping right to the box score," Torre told me over Gchat. "If they are reading a game recap, they're trying to identify the biggest or most interesting moments in a game as part of the general trend towards quick summary and bullet-point highlights. So if a robot can approximate that with any semblance of human intelligence, then that's something to be feared." Torre believes that as society moves more toward a "just the facts, ma'am" terseness, it's going to be deadline-driven Associated Press reporters and the like who struggle to compete with programs that can put together a quick game recap based on just a batch of stats. "It's not because the AP doesn't do a tremendous job—they do, and are continually underrated," says Torre. "But because what's often desired, post-game and in a pinch, isn't a well-constructed narrative." Like journalists, pharmacists are another group of well-educated professionals whose jobs are now in jeopardy because of robotics. Last year, Slate journalist Farhad Manjoo, whose father is a pharmacist, looked at PillPick, a robot that's been installed to fill prescriptions at the University of California-San Francisco Medical Center. PillPick is huge and expensive, but the machine, made by a company called Swisslog, is also extraordinarily efficient and more precise than a human being. You might want that quality on a job doling out potentially toxic medications: Experts estimate that more than a million people are injured and 7,000 killed due to so-called "medication errors" each year. The robot may look colder and uglier than your friendly neighborhood pharmacist, but does that matter if it's great at what it does? With society becoming more reliant on an ever-broadening range of drugs, the Bureau of Labor Statistics expects the need for pharmacists to grow by 25 percent between now and 2020. And with their median annual wage sitting at more than $111,000, human pharmacists are relatively expensive to employ. With this in mind, it's not surprising that more and more hospitals are choosing PillPick to replace their pharmaceutical staffs. Earlier this year, Benxi Central Hospital, one of the largest facilities in China, ordered a PillPick robot. Then, in July, Singapore's largest hospital group ordered five PillPicks. The Singapore sales were a "tipping point," said Stephan Sonderegger, Swisslog's head of healthcare solutions in Asia, in a press release. In other words, in case the smart students studying pharmacology are thinking of transferring, perhaps it's time to consider the fantastic robotics program at MIT. With robots now taking both high-skill and low-skill jobs, you'd have to be a fool to think that a robot could never come for your career. What's more, robots are becoming far more cost effective than they once were. It still costs millions to equip a pharmacy with PillPick, but a new robot from Boston-based company Rethink Robotics Inc., Baxter, was just put on the market for $22,000. That's about how much a human assembly line worker might earn annually. Except that Baxter will never ask for a bathroom break, health insurance, or vacation time. "This robot is never going to build an iPhone," Rethink Robotics founder and CTO Rodney Brooks told an audience at a robotics tradeshow in Pittsburgh this week. But Baxter can do things that require less dexterity, like picking parts up from a conveyor belt and putting them elsewhere, or sorting and packaging products for shipment. And with more than $60 million in venture capital funding keeping Rethink Robotics afloat, it probably won't be long before Baxter's successors can, in fact, build iPhones. In Terminator, the robots rose up and slaughtered the world's humans. This Skynet scenario was scary, but a more plausible future is pretty frightening as well. The robots don't exterminate us directly—they just slowly push us out of work, impoverishing the world's laborers until we're slaughtering each other to stay alive. Without a backup plan to adjust to a new paradigm, we can expect the worst. Civil unrest, riots, police brutality, and general distress of the population will continue to rise until critical levels are reached, at which point the whole socioeconomic system will crumble upon itself. This has negative repercussions across the whole spectrum of the population, and it is against the interest of everyone on this planet, even of the richest and wealthiest people. Illah Nourbakhsh, a professor of robotics at Carnegie Mellon University, agrees with Pistano. 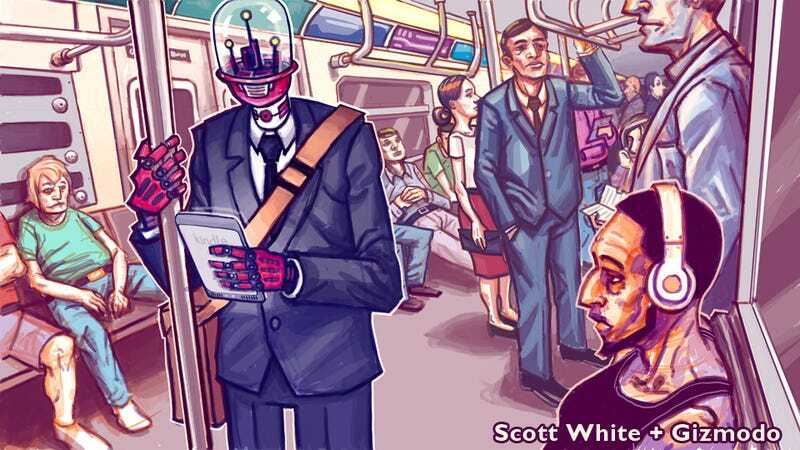 Nourbakhsh, author of the forthcoming book Robot Futures, says that the "chronic underemployment" robots could create has to the potential to be "very, very bad." But he also told me it's not too late to turn around. When people want to build a new factory, the government makes them do an environmental impact study to assess what impact the factory is going to have on the world around it. They look at what's going to happen to biodiversity and, if they give off toxic material, they figure out how they're going to remediate that. What's odd to me is that we have nothing like that for employment. Nourbakhsh says that he'd like to see the introduction of "employment impact assessments." These would require companies transitioning to automated workers to calculate—and then try to mitigate—the damage they'd be doing to the human job market. "We need to have these kinds of controls," he says, "because the captains of industry will do whatever they need to make more money, and replacing humans with robots will always make them more money." The responsibility to prevent a world overrun with mechanized labor isn't just on CEOs and industry titans. Nourbakhsh says consumers have to begin asking ourselves what we want out of society. Perfect service from robots? Or the gentler qualities only humans can offer? "Google is creating robot drivers for cars, but the robotic limo driver won't have a really great recommendation about the best bagel spot in New York City," he says. "We lose those kinds of nuanced, fun things with robots. We have to start putting a real value on them, the way we put a real value on labor costs—because they matter."